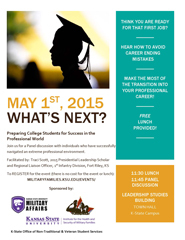 Join us for a panel discussion, Preparing College Students for Success in the Professional World, with individuals who have successfully navigated an extreme professional environment from 11:45 a.m. to 12:45 p.m. Friday, May 1, in Town Hall at the Leadership Studies Building. Think you are ready for that first job? Hear how to avoid career ending mistakes and make the most of your transition into your professional career Join us for a panel discussion with individuals who have successfully navigated an extreme professional environment. The event is free but lunch is provided, so please RSVP. Katrina Lewison, CivicPlus, manager of project administration, Manhattan, and MIL, Captain, retired. Judy Woodward, health promotion officer, 1st Infantry Division, Fort Riley. Capt. Racheal Tax, Combat Aviation Brigade Pilot, Fort Riley. 1st Lt. Joshua R. Humphrey, Military Intelligence Company Executive Officer Delta Company, 82nd Brigade Engineer Battalion, Fort Riley.